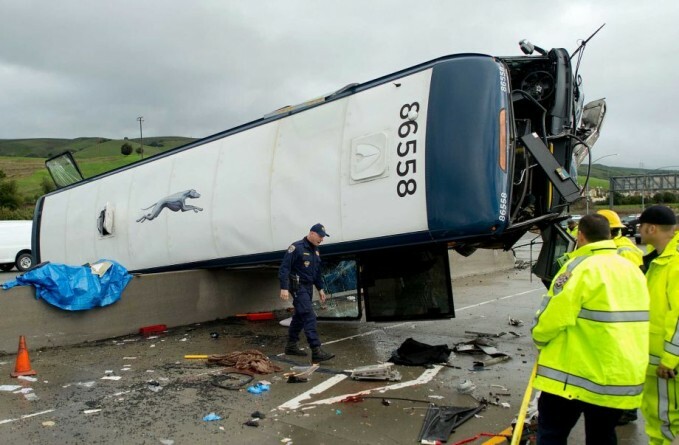 A Greyhound bus rolled onto its side during a rainy Tuesday morning commute in Northern California, killing two women and sending at least eight others to the hospital, authorities said. Several other victims suffered minor injuries and were treated at the scene in San Jose. One person suffered major injuries and three others were being treated for moderate injuries, the California Highway Patrol said. Several passengers with minor injuries were ferried to a hospital in a local commuter bus to be checked out by medical personnel for bruises and cuts, the CHP said. The Greyhound bus carrying 20 passengers and the driver rolled onto the center divider of Highway 101, a major commuting thoroughfare, while heading north around 6:40 a.m., said Lanesha Gipson, a Greyhound spokeswoman. The vehicle left Los Angeles at 11:30 p.m. Monday with stops planned in San Jose, San Francisco and Oakland, Gipson said. The driver began his shift in LA, and the company requires operators to rest nine hours between trips, she said. The accident is under investigation. The National Safety Transportation Board is sending a team of investigators, agency spokesman Eric Weiss said. The driver, who was one of those sent to the hospital, will be asked to submit a blood sample to test for alcohol and drugs, CHP Officer Chris Miceli said. Prosecutors have been notified, which is a routine measure, he said. "We still don't know what caused the accident," Miceli said. After the bus rolled, a driver traveling south hit some of the debris, damaging the car but leaving the motorist uninjured, Miceli said. The crumpled bus remained on its right side, straddling the center median, throughout the morning. 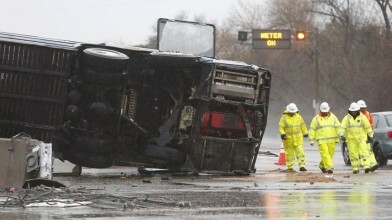 The accident snarled a commute already slowed by rain, backing up northbound Highway 101 for several miles. Yellow tarps appeared to cover two bodies near the front of the bus, where emergency workers in bright-yellow suits and firefighters worked in the rain. Fire trucks and ambulances were parked nearby. 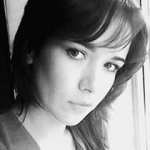 Authorities have not released the identity of the victims.